As we see in past too, when ever a movie is made with simplicity attached to our roots , patriotism , movie touches our souls. And there are many such people even today in rural areas who are not much educated , and track their lives just for the living of daily wages. In this manner , they forget their dreams. Our next Film SUI DHAAGA is an inspirational to those who forget their dreams in the form of daily wages. Also if we see , writers of film Sharat Kataria and Maneesh Sharma made DUM LAGA KE HAISHA in past which was also loved by audience , because it also touched the common man. 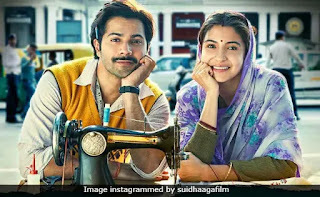 Sui Dhaaga is a story of Varun Dhawan (Mauji) who is married to Anushka Sharma (Mamta) . Mauji stays in a joint family where Mamta is whole day in kitchen serving their in laws . they dont get time for themselves as Mauji leaves in morning to work in a Machine shop where he is selling Machines. There he not treated well, so Mamta tells to leave and not to go where he is not respected. Mauji starts by one Machine sitting under a tree where they one MAXI for his mom and every one liked design that “From where did you get it?”. They get orders and now Mauji neighbor who were staying in their flat for free takes his machine back . Mauji and Mamta travel long on cycle for Stitching competition and bring Machine, Also now the life not easy for them as their brothers who were filling ears of parents that “Put Mauji on jab as he will earn 8000” . Their they take design on their names and machine too. Now , as we say if you have talent then you dont require recommendations. You can start from zero too and so time to fight Mauji to come back , where he collects villagers , teaches them Sui dhaga and enroll in Raymond fashion event. What happens next is the story where all fashion designers show models walk in designer ones, Sui Dhaaga Made in India reveals their dresses through common man where villagers walk in Sui Dhaaga design. Performances: Varun Dhawan is outstanding as usual , No doubt about that, Anushka Sharma is best too and performances of Mauji’s family especially in-laws are to engaging . Screenplay & Direction : I think writers Maneesh sharma and Sharat Kataria after a film like Dun laga ke haisha have said it all. They have it all in SUI DHAAGA MADE IN INDIA. From Brilliant dialogues to music , everything perfect and well portrayed. Review : Here only one I can say is SAB BADIYA HAI , The movie is motivation and inspirational to tell “Do what ever you want to” , Also to tell, Family should support their children ‘s dreams and not demoralise about starting new business that “From where will funds come” .